Sometimes in life we stop to smell the flowers, but have you ever stopped to think about how powerful flowers are? Flowers have the power to make us smile, can change the whole look and feel of a room. Flowers have the power to make one person forgive another. Now that's a lot of power! One workshop offered at Craftcation was Fresh Flower Accessory. Although unable to attend, I did reap a benefit. One of the ladies, Mary, that I met gave me one of the accessories she created with fresh flowers. It was a hair clip made with lovely yellow baby marigolds (?) I vowed to wear the clip each day until the flowers died. 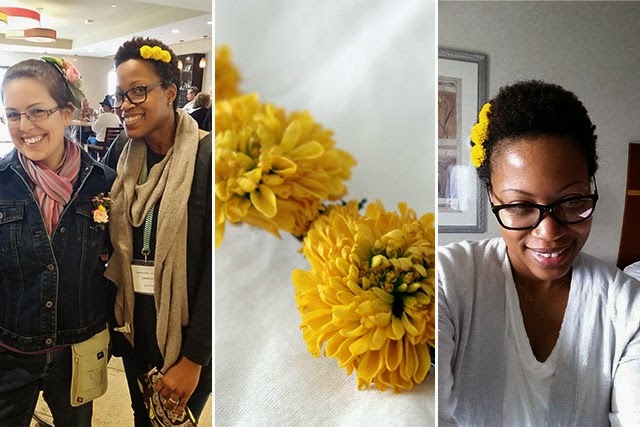 Everyday that I wore the barrette, I not only received countless compliments, but I got to meet and connect with women I may not have otherwise met. It was a real conversation starter. The flowers are now dead, but while they were alive and being worn, they possessed the power to connect people. Thanks Mary!